When Karima Akins finished kindergarten at a Syracuse elementary school, she was bursting with confidence and a love of learning. But first grade in a new school district almost broke her spirit. She began to struggle academically, and when her parents insisted she be tested for learning disabilities, some significant issues were identified. “The day I found out I had a learning disability it felt like the world crushed me into pieces,” she recalls. By the time she entered Liverpool High School, Karima was confident that she could do anything she set her mind to. She played the violin, sang in the chorus, and volunteered extensively. 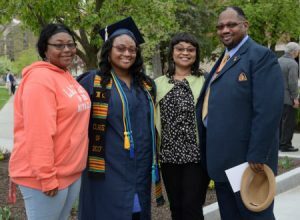 But even after being inducted into the National Honor Society and earning an academic letter, she was told she wasn’t “college material.” So she decided to challenge everyone who thought she’d never make it and insisted on making Syracuse University her academic destination. “I embraced my disability accommodations,” Karima says. Then she proved the naysayers wrong by enrolling at University College, becoming a third-generation SU student. Karima continued to feed her passion for community service. When a chapter of Delta Alpha Pi Honor Society was organized at SU in 2015, Karima became its president. Law school and a job in government remains one of Karima’s goals, and she even dreams of using her entrepreneurship studies to create her own law firm. “I’m different, and there’s nothing wrong with it,” Karima says. And she proved it by graduating from Syracuse University in May 2017 with a Bachelor of Arts from the College of Arts and Sciences.